Associated Bank recently treated a group of veterans and their guests to the Packers vs. Chargers game at Lambeau Field. 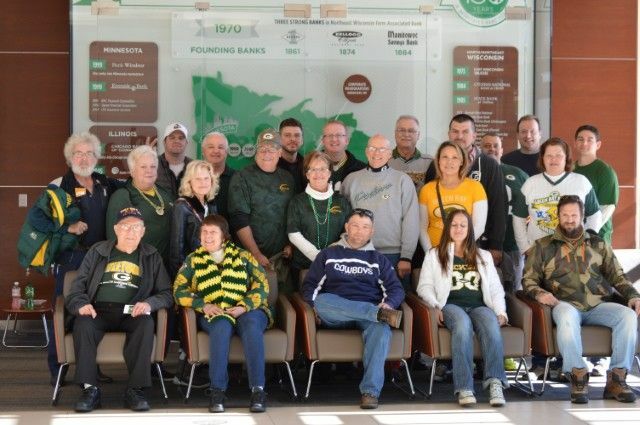 For the third consecutive year, the Associated Veterans Network (AVN) has hosted 20 guests at a Packers game. The group met at the Associated Bank Center in Green Bay for tailgating and snacks before being bussed to Lambeau. Customer Care System and Support senior and member of the AVN, James Ryberg, and his wife hosted the veterans while at the game. They enjoyed indoor seating, food and beverages, and the cheering of over 78,000 fans. This year, veterans — most of which are customers — came from all over Associated Bank’s footprint. Below are some of the comments from those who attended. The AVN is dedicated to providing support to military colleagues and community members by providing a resource for personal and professional development, and getting involved in programs and activities across Associated Bank’s footprint that support veterans, service members and their families.